Man Up Jewellery is a family owned business, which was established back in 2012. We initially started in New Zealand as we saw a gap in the market to offer Grooms much more than the standard silver or gold wedding bands, with alternative designs and metals at an affordable price. As the business continued to grow we were getting flooded with enquiries from our friendly neighbours in Australia, so we decided to expand into the Australian market which has been hugely successful and we have never looked back! ➳ Tell us about what MANUP JEWELLERY AUSTRALIA offers Grooms for their Wedding day? 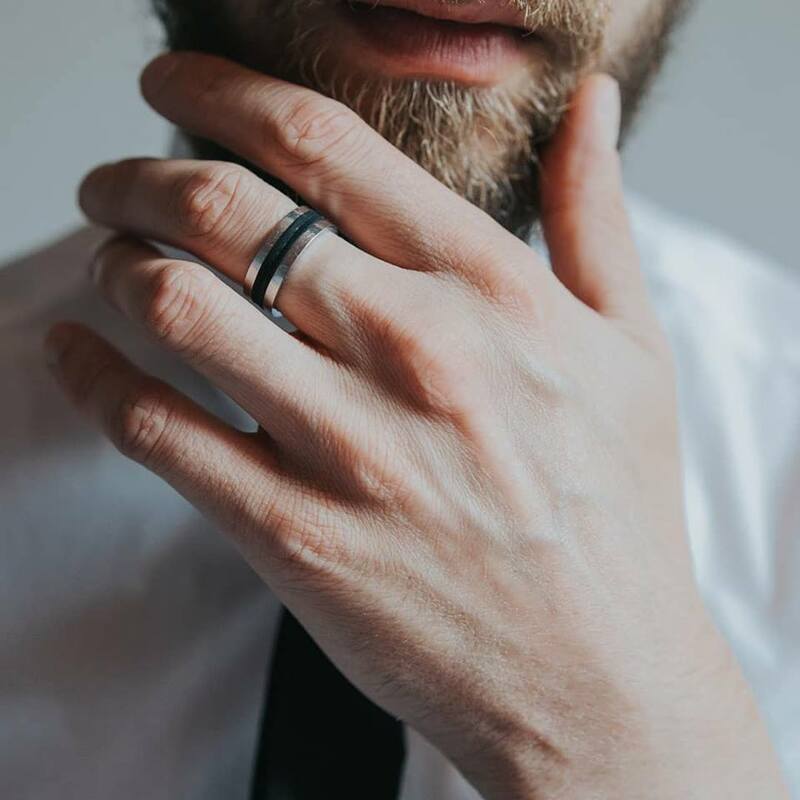 We believe Grooms deserve to have alternative style options for their special day just as much as the Bride and we offer Grooms an incredible collection of men’s wedding rings to choose from. We range alternative metals such as Tungsten and Titanium, which are booming in popularity as many people look for alternatives to the traditional plain gold and silver bands. These metals are extremely strong, lightweight, and affordable and offer an endless range of colours and styles to suit the modern Groom. We always work as closely with the Groom as we can (or the soon to be Bride) to understand what they are looking for in a ring as well as ensure they choose the right size. We can send free ring sizers to customers if needed to ensure the right fit first time, and in the rare instance the size isn’t quite right, we will happily and quickly replace the ring for the perfect fit. If we don’t have a style or design that the Groom is looking for, we make sure we can offer solutions to ensure nothing puts a dampener on their big day. Our team definitely goes the extra mile to offer quick and personable customer service. Our focus on service is paid back many times over by all the emails and pictures from the blissfully happy Brides and Grooms sharing their excitement of their special day! ➳Did you always know that you wanted to design custom jewellery? We have always been interested in jewellery but the one area we felt could be improved was to offer men’s rings, in particular, as we found they tend to be straight gold or silver, etc. We think men deserve to have additional style options as well at affordable prices. ➳ Do you have any classic stories that you would like to share from your experiences? We have lots of wonderful stories from our customers, with one being a lovely lady who purchased one of our rings as an engagement ring as she was planning to propose to her “soon to be husband”. We received an amazing email from her telling us about her proposal with wonderful pictures of her proposing. It definitely puts a smile on your face knowing that your customers sometimes see you as a “friend” rather than just a “vendor”. ➳ What advice would you offer to a Bride + Groom that is just starting out on their search for the perfect Wedding band? When you find that special someone that you want to spend the rest of your life with, the first purchase is usually the engagement ring, the second the wedding ring. The engagement ring and wedding rings are the two purchases that will be with you forever. This is why it is essential to select what you love and take your time choosing what works best for you. To give yourselves enough time leading up to the wedding day we suggest purchasing your ring 3-4 months before the wedding. ➳ Tell us about the best part about what you do: The best part of what we do is knowing that you have been a part of someone’s most special day of their life, their Wedding day.